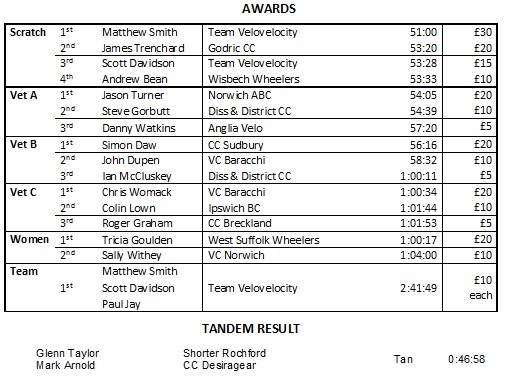 Congratulations to Matthew Smith of Team Velovelocity who won the event and beat Ian Cammish’s winning time from 2013. There were a total of 21 improvements to LTS times as well as 3 riders who had never ridden a 25 before which meant a lot of happy faces afterwards. The tandem pairing of Glenn Taylor and Mark Arnold put in a phenomenal performance to stop the clock in 46:58 – just shy of 32 mph average. Thank you to everyone for supporting the event and for riding safely. Thank you also to the timekeepers and members of VC Norwich, without whom the event would not have run smoothly. We hope to see everyone again later in 2014 at the VC Norwich August Bank Holiday 10 and don’t forget our other club TT’s as detailed on our Calendar page here on the website.